"We have a risk of a melt-up, not a meltdown here. Despite where the markets are in equities, we have not seen money being put to work," the head of the world's largest asset manager tells CNBC. "Many people thought we were going to be in a period of rising rates. We were not and we saw huge underinvestment and people had to rush into fixed income," Larry Fink says. "We have not seen that in equities yet." "We have a risk of a melt-up, not a meltdown here. Despite where the markets are in equities, we have not seen money being put to work," the head of the world's largest asset manager told CNBC's "Squawk Box." "We have record amounts of money in cash. We still see outflows in retail in equities and in institutions." 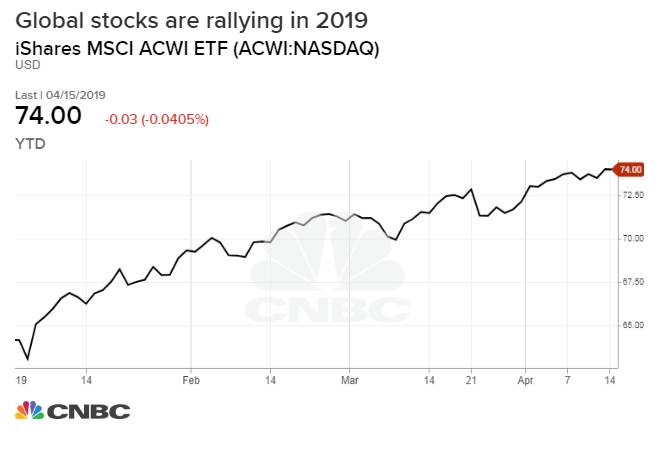 The iShares MSCI ACWI exchange-traded fund, which tracks global stocks, is up more than 15% this year. In the U.S., the S&P 500 has rallied nearly 16% through Monday's close and is within 1.5% of an all-time high set in late September. The Federal Reserve slashed its rate projections to reflect no hikes in 2019. The U.S. central bank also indicated it will end its balance-sheet reduction process earlier than expected. Meanwhile, the European Central Bank pushed back plans for future rate hikes. It also announced last month it will issue cheap loans to banks in the region. "Many people thought we were going to be in a period of rising rates. We were not and we saw huge underinvestment and people had to rush into fixed income," Fink said. "We have not seen that in equities yet." Fink added that, with central banks being "more dovish than ever … there is a shortage of good assets" for investors, which could ignite the melt-up in the global equity market. Fink's comments follow the release of better-than-expected earnings from BlackRock. However, the company's overall revenue missed expectations as it fell 7% on a year-over-year basis. Shares rose 2.4 percent Tuesday morning.